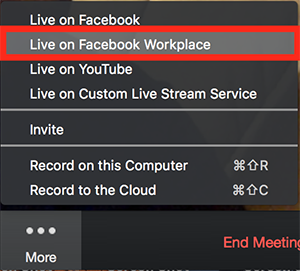 Enable the Live on Workplace by Facebook option to allow members of your account to live stream meetings to Workplace by Facebook. You can also live stream a webinar on Workplace or configure the Workplace bot to easily start or join a meeting from workplace. Learn more. Navigate to the Live on Workplace by Facebook option on the Meeting tab and verify that the setting is enabled. If the setting is disabled, click the Status toggle to enable. If a verification dialog displays, choose Turn On to verify the change. Note: If the option is grayed out, it has been locked at the Account level and needs to be changed at that level. (Optional) If you want to make this setting mandatory for all users in this group, click the lock icon and then click Lock to confirm the setting. Note: If the option is grayed out, it has been locked at either the Group or Account level, and you will need to contact your Zoom administrator to make changes. Start a meeting on your desktop client. Click the more menu at the right-hand side of the meeting controls and choose Live on Workplace by Facebook. A dialog displays in your browser, asking where you want to post your live video. Choose whether to share on your Timeline, in a Group, or in an Event, the click Next. This displays a dialog where you can choose Basic, Advanced, and Stream Key options. This displays a preview of the video, followed by a series of messages that indicate progress. The Workplace by Facebook page opens, showing your live meeting in the location you chose.